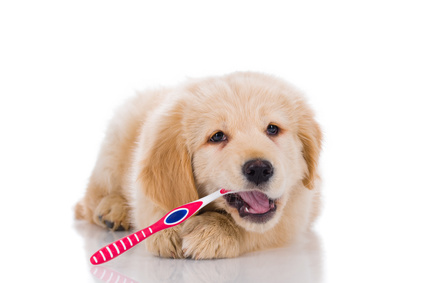 Brushing your puppy's teeth is a quick and easy way to keep his teeth and gums healthy and strong. Once Fido has all his deciduous teeth (aka 'milk teeth' or 'baby teeth') in place at around 8 weeks of age, it's a good idea to start getting into a routine of brushing his teeth regularly. His tiny teeth are clean and white right now, and he won't be keeping them for more than a few months, but soon his 'big' adult teeth will start to come in and he'll be hanging onto those for the rest of his life! Getting your pup comfortable with having his teeth brushed now is important, and good dog dental hygiene is an important part of his health care...... and your responsibility as a caring puppy parent. It might surprise you to know that plaque can turn into tartar within about 36 hours... so regular brushing IS important as your pup grows up. You really want to aim for a daily brushing if at all possible. It only takes a few minutes to do (once you both get the hang of it), but those few minutes could prevent a lot of problems from rearing their heads down the road. If you have an older pup, or adult dog, check out this page to learn how to brush his teeth properly, why professional dental cleanings are vital, and to see some of the best (and most popular) dog dental care products on the market - Dog Teeth Cleaning 101. There are all sorts of dog toothbrushes and toothpastes on the market, so you'll be spoiled for choice! Don't go overboard at first though. You can do just fine with some basics to begin with, and you'll find which ones work best (and your puppy prefers) through some trial-and-error. Once you've got that down, you can spend a little bit more without risking it being money wasted. A soft toothbrush - one especially made for puppies/dogs or a tiny, soft, children's toothbrush. There are also 'finger toothbrushes' for dogs which work well for young puppies and small to medium sized dogs. Toothpaste - NOT one designed for humans! You need to buy special toothpaste designed for dogs. 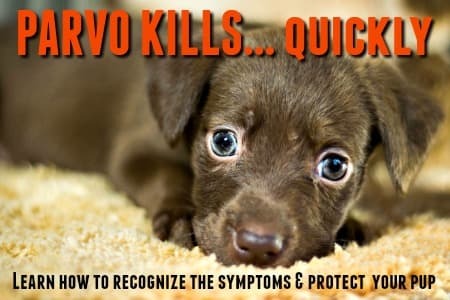 The stuff we use can upset your pup's tummy and/or make him vomit, plus he probably won't appreciate the taste! You can add some healthy, dog dental treats and give them as a reward as soon as you're finished with the exam and brushing too. Brushing puppy teeth isn't a difficult task, but you do need to have the right supplies on hand and be gentle and patient with your pup. After all, it's going to be a strange sensation for him at first and most puppies don't especially like having their mouths handled to begin with. Luckily, puppies learn FAST and they love habit and routine. Once you've brushed his teeth regularly for a week or two, he'll begin to anticipate the process, and accept it. Choose a quiet spot and a time when your pup is feeling calm, and isn't too tired or overly-energetic . 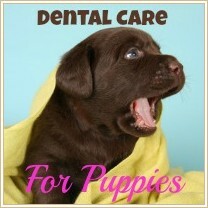 Try to work towards setting your puppy teeth cleaning session at the same time each day. Puppies love routine and it helps them to feel secure and relaxed. Make sure you have the brush, toothpaste and treats close at hand. Sit down with your pup, or put him on your lap. Speak gently and quietly and don't get cross or impatient if he wriggles or complains - remember this is new to him too! Spread a small amount of the toothpaste onto the brush and using one hand, gently pull back your pups upper lip at the front side of his muzzle. Use the other hand to and gently 'brush' (or rub if you're using a finger-brush) his upper Canines (the 'fangs') and the first upper Pre-molars (the large, 'double-teeth' towards the back of his mouth, these first ones are about half-way back). Once you've found the 'right teeth' you can let his lip go if it's easier, and simply brush in gentle, circular motions. Try to angle the brush so that the bristles are tilted upwards facing the gum line. About 5 seconds per tooth is about right, but at first you may only get 1 or 2 seconds -that's okay, it will get easier. Once you've got the upper teeth taken care of you can move onto the corresponding teeth in the lower jaw, and then the Incisors at the front, and the rest of the Pre-molars in the back (top and bottom). Concentrate on the outer side of each tooth (next to the cheek) as that's where the problems most often occur. The inside surface of each tooth doesn't need to be brushed and the top area can be if your pup doesn't mind, but it's not as important as the outer side. Little Fido needs to learn to accept you touching his mouth and teeth. An adult dog who hasn't learned to be calm and obliging in this area can be really difficult if there's a problem in his mouth! Usually you can get all of his teeth brushed in about 2 minutes once you've had some practice. Puppies only have 28 baby teeth, but once his adult teeth come in there will be 42 big ones to take care of, so it may take a little longer then. The period between 3 months and 6 to 7 months is when your puppy is teething, and this can be a challenge for him (and you). He might be in some discomfort, or even pain, and his desire to chew and bite is at it's peak. 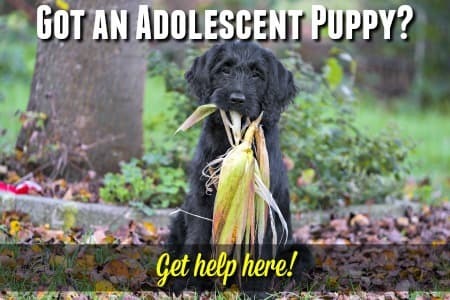 Luckily there are things you can do to help him feel better, and discourage the inappropriate biting and chewing that is a normal part of this developmental stage.